Richard Newman and Gina Chiarelli in Bar Mitzvah Boy. What are the moments that define our lives? In Vancouver playwright Mark Leiren-Young’s new comedy, Bar Mitzvah Boy, the moment comes late in life for Joey. A successful divorce lawyer, Joey used to things going his way. When he suddenly decides he needs a Bar Mitzvah he doesn’t expect to have to wait, or take classes. But when he meets Michael, an acerbic rabbi with to-do lists of her own, what begins as a simple bureaucratic checkbox becomes a deep immersion in the meaning of ritual, maturing, and friendship. In this Q&A we find out more from the playwright about this world premiere. What is Bar Mitzvah Boy about? Faith. Community. Pretty much every question I could think of about faith when I was writing this. What inspired you to write this show? The initial inspiration came from when I was a teenager and my friend Steve talked about how he’d never really felt Jewish because he’d never had a Bar Mitzvah. I thought, I have to write about that some day. It’s an idea I’ve never been able to shake. 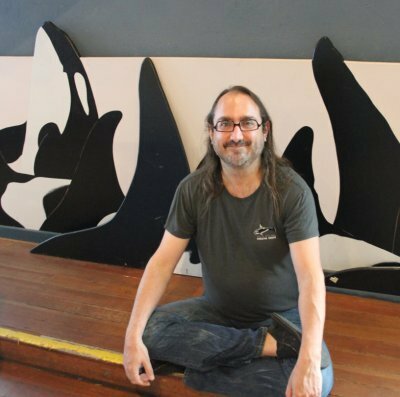 When I was writing the script, I had Pacific Theatre in mind, both because they’d done a lot of work that blew me away and because I felt this would connect with their audience.” – playwright, Mark Leiren-Young. There are parts of me in Joey, parts of me in Michael. I also borrowed liberally from the lives and experiences of friends and strangers and, after that, Joey is Joey and Michael is Michael. What is it like hearing your words out loud? It is always cool hearing great actors play with my words. And this is the third pair of great actors I’ve seen dive into this. I try never to send a play to a theatre until I pull together a reading with friends. So, I had a great reading with some lovely actors in Victoria before I sent this to Pacific. After that the play won the American Jewish Playwriting Prize last year for best new Jewish play. So, it scored an amazing workshop and staged reading in New York, with a great director, two awesome actors, thirty-nine hours of rehearsal, lights, sound design. Who does sound design for a reading!? Then it was staged as one of the key events at a festival of new Jewish work. Have you been tweaking the script as they work on it? Who is the audience? What do you hope they will experience? When I was writing the script, I had Pacific Theatre in mind, both because they’d done a lot of work that blew me away and because I felt this would connect with their audience. I even met with Ron before I dove into it. I’m a big fan of sparking conversations, so I’m always hoping people will want to at least grab a coffee after the show and talk about it. If they’re still talking about it a week later, even better. Bar Mitzvah Boy opens Friday, March 23 and runs until April 14 at Pacific Theatre in Vancouver. Visit http://pacifictheatre.org for tickets and information.